We have just published a new Limited Edition (1000 copies) of Take it Easy. 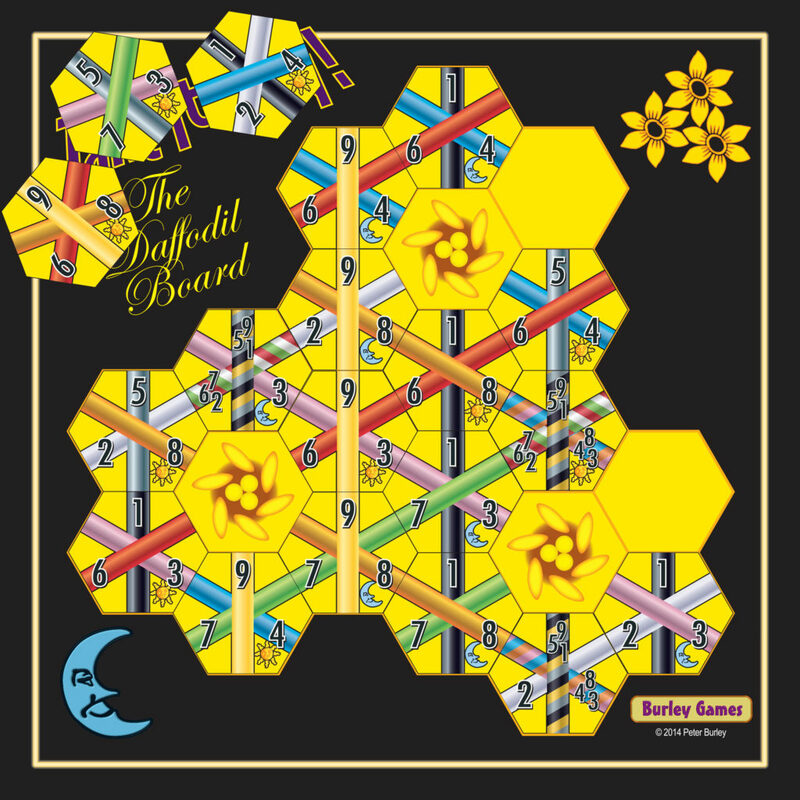 This new edition (called the Daffodil Edition) features double-sided playing boards. On the flip-side of the standard boards, there are special boards, called The Daffodil boards. These contain a configuration of hexagonal spaces which is different from the one on the standard boards. Also supplied with the new version are four extra tiles per player. These tiles feature wildcard stripes which can be used as any of three different colours. Standard Take it Easy Sold Out! At the moment, we have completely sold out of ‘standard’ Take it Easy. This situation will be remedied soon when we take delivery of our share of a large International Edition. This is being produced as a cooperative release with Eagle/Gryphon Games in the USA. This version will be distributed in the United Kingdom, the United States, Scandinavia, Japan and Korea. At the same time, we are releasing new versions for all the French-speaking nations, for Greater China, including Taiwan, and all the South East Asian countries. Buy the Daffodil Edition for the Price of Standard Take it Easy! Please note that the Daffodil Edition should really cost a little bit more than the standard Take it Easy, but until we take delivery of the International Edition, we will be selling the Daffodil Edition on this website at the price normally charged for the standard game. So hurry folks, if you would like to receive a copy of the Daffodil (Limited 1000-copy) Edition for the price of a standard Take it Easy. 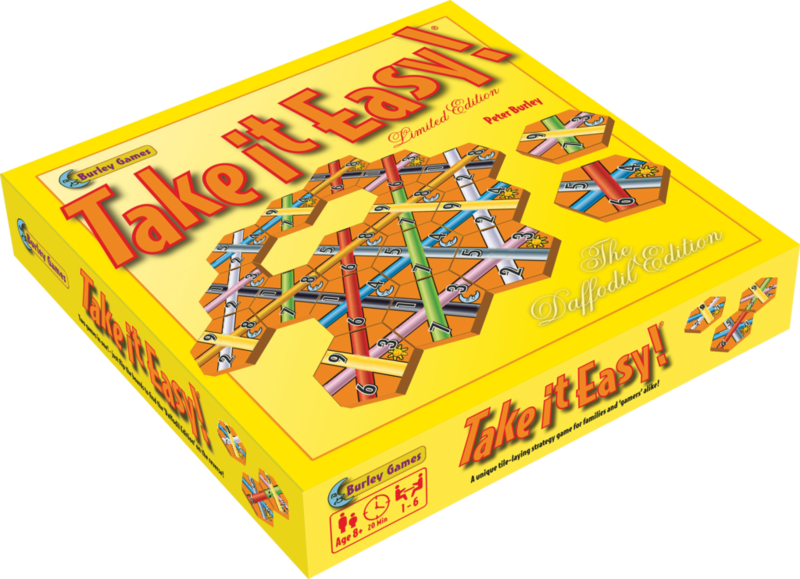 ‘Take it Easy!’ has won numerous awards, including a nomination for Spiel des Jahres (Game of the Year) in Germany in 1994. 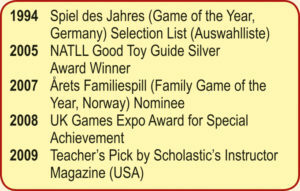 Spiel des Jahres is recognised as being the most prestigious award in the world of gaming. ‘Take it Easy! – the Daffodil Edition’ is a game for 1-6 players aged 8+ and lasts about 20 minutes. Rules are provided in English. The board and pieces are language-independent.